O’Sullivan himself had walked in the boots of the conquistadors who roamed through the western deserts. One anonymous soldier left an inscription carved on the face of a rock, marking his passage. 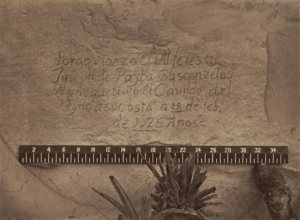 In the same year he photographed Canyon de Chelly, O’Sullivan carefully placed a ruler to show the scale of the writing and then photographed the message of the Spanish invader. But with the rare exception of finding the traces of history, it was O’Sullivan, along with the other early photographers, Andrew Russell, Alexander Gardner, William Henry Jackson, all connected to survey parties and railroads, who recorded the second invasion of the land of Native Americans. Like the Spanish, the American corporations came to conquer, and, backed up by the government military, they were paving the way for white settlers and the displacement of the original inhabitants. But the 1970s rethinking and re-en-visioning of the land that continued with the work of the “Rephotographic Survey Project,” initiated by Mark Klett, researched by Ellen Manchester, along with the photographer JoAnne Verberg in the summer of 1977 had everything to do with history and nothing to do with the politics of Manifest Destiny. The original trio was joined later by Gordon Bunshaw and Rick Dingus. In fact, the RSP, dating from 1977 to 1979, needs to be understood, not in terms of the past but in terms of the contemporary backdrop against which photographers were acting. The Survey was systematic and investigative, with the historian, Ellen Manchester, and the re-photographers, Mark Klett, Rick Dingus and Jo Anne Verberg, functioned like detectives, tracking an operative. The project which, painstakingly relocated each site and determined the time of the year and even of the day and the position or framing selected by the first photographer, examined the choices and the decisions made by the photographer. When each photograph by a Re-Photographer was made from the exact camera and lens positions as the original photograph, the new image revealed not just the impact of time and modernization upon the land but also–possibly–the mindset of the photographer. 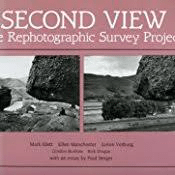 The result of this investigation was the book, Second View: The Rephotographic Survey Project (1984). Put in motion during the awakening of the contemporary environmental movement, the RSP was painstaking and meticulous but was viewed later as being an extension of a critique of westward expansion. The sense of a re-seeing of American history only became more acute with the re-writing of history from the standpoint of multiculturalism, including women and Native Americans in the traditional account. The words “virgin land” and “penetration” of the West, as well as the “taming” of the West were re-interpreted, not as benign descriptions of a process but as the sexist terminology of a phallic intent to conquer. By the 1980s, the notion of Manifest Destiny as a positive force that “won” the West was challenged by the new critique of racist policies that included deliberate genocides that preceded the incarceration of the Native Americans in reservations. It is with an expansive re-writing of history as the backdrop of the Project, which was led by Mark Klett (1952-), that the pairings of images can be evaluated. Among the earliest reevaluations of the ways in which the original inhabitants were cleared from their own lands was Bury My Heart at Wounded Knee: An Indian History of the American West by Dee Brown. This classic book, still resonant today, was published as early as 1970. An invention of cultural myth, the word “West” embraced an astonishing variety of surfaces and practices, of physiognomic differences and sundry exploitations they invited. The Western lands provided resources essential as much to industrial development after the Civil War as to cultural needs of justification, incentive, and disguise. Land and minerals served economic and ideological purposes, the two merging into a single complex image of the West: a temporal site of the route from past to future, and the spatial site for revitalizing national energies. As myth and as economic entity, the West proved indispensable to the formation of a national society and a cultural mission: to fill the vacancy of the Western spaces with civilization, by means of incorporation (political as well as economic) and violence. Myth and exploitation, incorporation and violence: the processes went hand in hand. The 1984 book revealed one hundred twenty pairs of images taken by the first photographer who originally “viewed” the western territory through the eyes of white men thinking of “opening” the vast spaces to colonizers. During the first year, the re-photographers retraced William Henry Jackson. Jackson had served in the Civil War and shortly after the war ended, he joined the Ferdinand Vandiveer Hayden survey which took him into the extraordinary world of Yellowstone. The subsequent section of the Project included the three photographers who had worked embedded, so to speak, with the Federal Army during the Civil War. Andrew J. Russell had recorded the work of military engineers and was ideally suited to follow the trek of the railroad running west, the Union Pacific. Timothy O’Sullivan and Alexander Gardner had spent the greater part of the Civil War documenting the fallen, strewn across the battlefields of the borders between the United States and the Confederacy. All of these photographers must have found the endless possibilities of the West, the wide open spaces, the broad sky, the endless sun, and the unindustrialized quiet of the plains a great source of solace after the noise and carnage of a war. Whatever their sentiments, the quartet set about their appointed tasks as professionals, acting under orders and all probably had more supervision than they had during the Civil War. O’Sullivan served under two government agencies, the geological survey expeditions of Clarence King and George Wheeler, and would have been expected to fulfill a particular brief. “Repeat photography,” as it was first called, was based upon scientific bases: to recreate faithfully and to reveal the original state of the scene. However, Klett was not attempting to see as the first photographers viewed the land, His position was that it was important “to see them in our own terms.” In other words, Klett was recording change, whether through wind, water or weather or through human intervention. We can only see the world from our own vantage point. So the view is double: the past and the present are juxtaposed in dual visions of the West. It says a great deal about the still experimental and comparatively primitive state of photography to realize that the working methods of Mark Klett had to faithfully reproduce the methods of photographers who often made their own cameras, ground their own lenses and employed a variety of safeguards to protect the plates in hostile environments. For example, a photographer might have stood on a particular place that no longer exists due to development or natural erosion or the position and framing selected has to also take into account which lens was used. In addition, unlike Jackson who took the first photographs of Yellowstone, the photographers were often taking note of exploitation of the land, such as mines, already underway, careless use that would cause the environment to deteriorate over time. By the late 1860s, the corporate probes are already in place and even Jackson winds up watching the railroads wind around and under seemingly impassible mountains. HIs images of American engineering, feats undoubtedly hone during the recent war, show an impressive mastery of nature that must have been inspiring to all who saw these images. 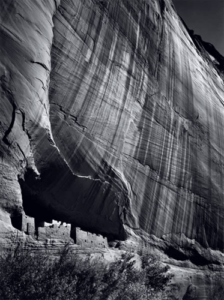 As Berger pointed out, it is not change–of nature itself, of the site, of the state of the environment– that is being found by the rephotographers but the choices made by the original photographers who were tasked with photographing the West. As pointed out in previous posts, either consciously or unconsciously, these artists would have had a built-in visual vocabulary derived from landscape painting, but the West thwarted any preconceptions. At most, the West could fit into the category of the “sublime.” But the survey photographers had more mundane instructions: documentation without drama. The next post will continue to discuss the process of photographing the already photographed.